Today I wanted to share a fun little headband I made for my Little Miss for Christmas. Yes, it is another Christmas gift from her Dress Up Box. And I'm loving all the fun felt flowers I've been seeing everywhere. But I actually got the inspiration from one of our local girly jewelry stores. We went along with my little niece to get her ears pierced this summer. While we were their Little Miss ran around looking and trying on everything. She put on the cutest little headband with flowers and it was SO cute I almost died. However, I was not about to spend money on something I knew I could make. So the Flower Headband was born. I decided I could make a fun little headband using what I already had at home. It is perfect for dress up and she LOVES wearing it around the house. For the first flower, I cut a long rectangle of 2.5" x 7". Fold it in half with long sides together. Slice through your fold about half way. Carefully roll your flower from one end to the other. I used hot glue to glue the ends together. You can make them larger or smaller. The second flower was pretty simple. Cut out a flower shape. My shape was about 2" across. With your scissors, cut a spiral into the center of your flower. Starting at the end, roll your flower into the center. This will make a bud with petals like a rose. Either glue or handstitch around the base of the flower. The bigger your flower at the start, the larger your flower. You can also use THIS flower tutorial to make a t-shirt flower and I cut our a few leaves in green felt. Depending on home many flowers you want on your headband, you can also check out some other flower tutorials on pinterest. Grab your headband and hot glue gun. 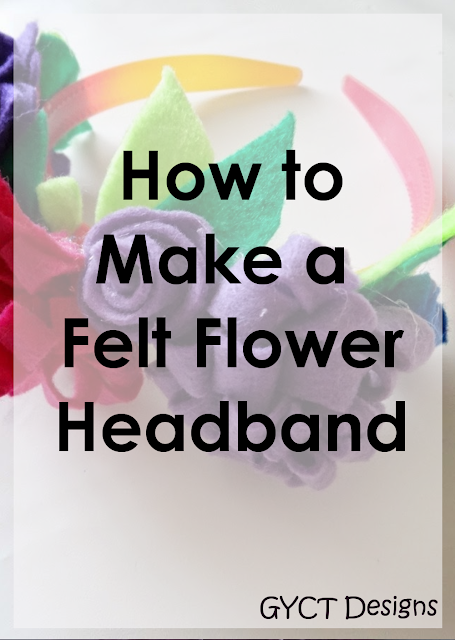 Start placing your flowers and leaves in the center of the headband and work your way out. You may want to angle them different directions for different looks. Tada! You are done. Simple, fun and perfect for your little ones imagination. My Little Miss usually wears her's around with her fairy wings or in her princess dresses. Now you can go add it to your Headband Tower so you'll remember to wear it.